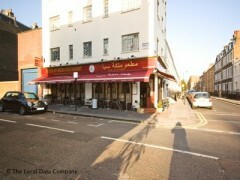 About: First Yemeni Restaurant in London specialising in Arabian, Yemeni and Middle Eastern food. Offers a wide range of Yemeni food cooked by Yemenis. Warm and welcoming staff with a very hospitable atmosphere. Whilst Alcohol is not sold, customers are welcome to bring their own. Glasses and cork openers are supplied at no extra charge.